QMotion is constantly taking giant leaps in the design of window treatments to offer you the most sophisticated and aesthetically designed shades on the market. QMotion’s motorized roller shades incorporate the batteries, motor and gear inside the tube creating a sleek, unobtrusive design option for window treatments. Their award-winning motorized drapery rod is the first and only track-less motorized drapery rod in the market. The latest innovation in automated window treatments! The first and only track-less motorized drapery rod in the market has arrived. The real beauty of QMotion’s innovative new product is what you don’t notice. 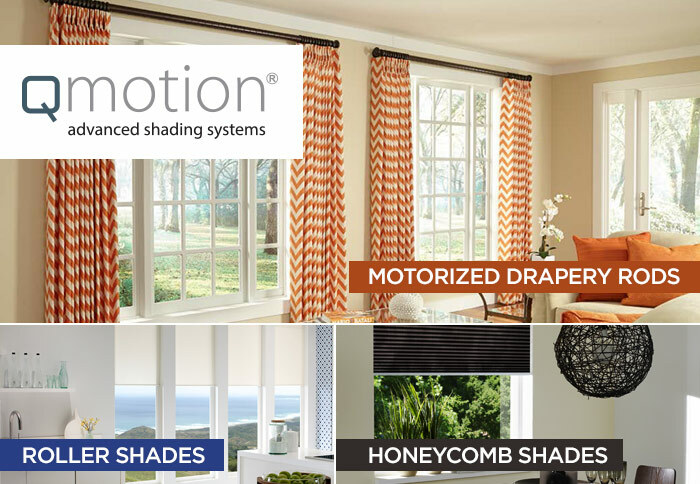 QMotion’s automated roller shades offer state-of-the-art natural light control with a unique selection of elegant fabrics. With unmatched quietness they are virtually soundless when in operation. Qadvanced Automated Honeycomb shades are elegant, color coordinated, available in a wide range of colors, and fully compatible with the controls for Qadvanced Roller Shades. As an authorized dealer, we have the expertise to match QMotion’s fantastic product range with your needs and budget. We will work with you to plan, execute and evaluate your home automation system.